Boston’s public bike-share service, Hubway, announced a new partnership Wednesday with Blue Cross Blue Shield, a health insurance company, that will expand and rebrand their bike-share service to a new name, Blue Bikes. The Blue Bikes expansion plan is the result of a six-year partnership between Hubway and the Massachusetts branch of BCBS which aims to broaden public access to rental bikes in the city. 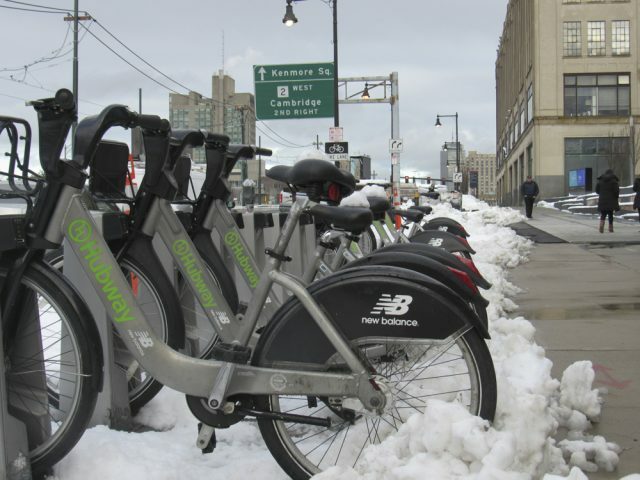 Amy McHugh, director of media relations for BCBS Massachusetts, said her organization will be contributing nearly $20 million to enhance Hubway’s bike-share service and promote exercise and healthy living in the Commonwealth. By the end of 2019, an estimated 3,000 “Blue Bikes” will be available in Boston. The existing Hubway infrastructure will gradually be rebranded under the Blue Bikes label over the coming year, according to a press release from the bike-share operator Motivate International Inc.
McHugh said BCBS will reveal more details regarding its Hubway expansion plans in the next few weeks. McHugh said she hopes the Blue Bikes service will encourage Boston residents to choose biking over other methods of transportation that have a larger carbon footprint. By expanding bike-share services to different communities in Boston, she said Hubway and BCBS aim to make the city more accessible to its residents. Dave Anderson, 51, of the South End, said he thinks the Blue Bikes expansion will allow for easier access to less-traveled areas of the city. Blue Bikes, like Hubway, will serve as a public transportation service under the management of the local government in Boston and other participating cities, including Cambridge, Brookline and Somerville. Boston Mayor Martin Walsh announced his support for the Blue Bikes program and his enthusiasm regarding Hubway’s partnership with BCBS. Local trucker group, the Trucking Association of Massachusetts, spoke out against the expansion this week, noting safety concerns for bikers and liabilities for truckers who are unable to spot bikers in their blind spots. Evan Daniels, 60, of Fenway, said as a former truck driver, he remembers feeling nervous when bikers were on the road. He said he anticipates that the increase of bikes in Boston will cause more collisions and serious injuries for riders. Denise West, 56, of Back Bay, took a break from biking along the Charles River Esplanade to explain to The Daily Free Press why she thinks the bike-share system is important to Boston’s transportation industry.